The last week before Christmas just began and now it is really just around the corner. And if I'm honest, I still don't quite now what I'd like to get this year. 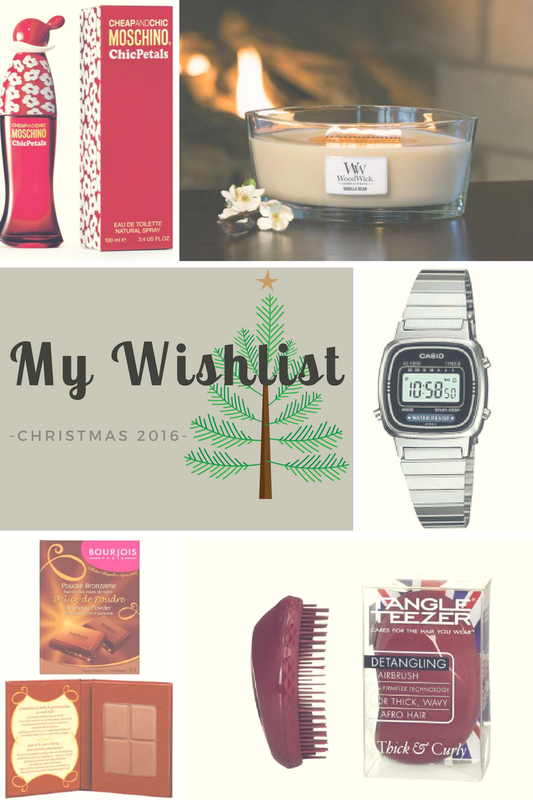 However, I came up with a few ideas that would make great gifts for me, so let's have a look! Before I first discovered this perfume, I was totally in love with Escada's Cherry in the air and when they discontinued it my heart pretty much broke. It took me some time to find another perfume that I'd like just as much, and it's the Chic petals perfume by Moschino. It smells very glamourous, though still pretty sweet, which I really like. I have already been asked SO many times what perfume I'm using and I am still surprised every time I hear that question. I have never been a watch person and I only got myself a watch for the first time when I passed my finals. Before that I only got one watch gifted when I was around 10 or so I think. It was from the brand STAMPS and it looked really cool but it's just too bulky for my wrist. So when I was looking for the perfect watch two years ago I chose a Swatch with a long strap that you wrap around your wrist twice. I like it a lot but the battery died and for some reason I am too lazy to go and get it exchanged. Still, I do need a watch at work and uni too so I decided to get my hands on a retro Casio watch that somehow everyone seems to like at this moment. The reason why I want exactly this model is because of the digital display. Normal watches take me quite a while to figure out what time it is, so this one would be just perfect. If any of you had one of those, you will know that they last for years! I've had mine for nearly 3 years now and only a few months back I hit the pan. It's now getting more and more difficult to use it, but it will still last me for probably half a year or longer. Still, I want a new one, just in case they decide to discontinue it for some reason ( like the Escada perfume, or Bourjois in general in Austria). For many people the bronzer seems to be too orange but with my complexion it works great, especially in summer or with foundation. I have to be honest and say that I tend to use quite a lot of bronzer for my contour because without it I feel like a potato face. I bought my Tangle Teezer two years ago just after Christmas and I immediately realised what a difference it makes. My mum always spent ages on detangling my thick hair ( it used to be much thicker than it is now), and I wish we had a Tangle Teezer back then because it would save us a lot of time, energy and hair. I can't use any other hair brush anymore and I really recommend a Tangle Teezer for all the girls who have the same problem as me. I have to brush my hair so many times throughout the day so that it stays pretty, and thanks to the Tangle Teezer I am done within a few seconds. The problem is that when I blow dry my hair, I always use the tanngle teezer to brush through my hair and due to the heat the bristles melted a bit and they are not so straight anymore. I also dropped it quite a few times and it's now falling apart in two pieces so often and that's really annoying. This definitely calls for a new one! Let me know what you're wishing/ hoping for this year!